Soloan realizes any installation you’d like to treat wood, metal or plastic with. Large or small, mobile or fixed, temporary or permanent, new or refurbished, and always custom-made. Construction is our thing and we master inside and outside paint and coating practices. This means we can provide you with targeted advice, as well as implementation. Customisation is the standard practice for us. Our expertise is as broad as your production. We have the right installation for every activity. In addition to installations for coating and powder coating we also realize systems for drying, sanding, mixing, extracting, ventilating/heating and transporting. By integrating all these systems you will be able to save a great deal of working hours and money. Moreover, this modular set-up enables us to tackle any situation, tailoring it to your space and financial requirements. And if you want to replace or expand an installation, look no further. We take care of your installation from A to Z and provide turnkey delivery. 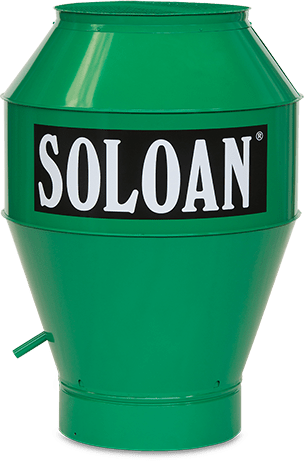 Soloan supports you fully, from the initial design and engineering to assembly and commissioning as well as afterwards (maintenance, support). We can even assist you with your Risk Inventory & Evaluation (RI&E). By executing all the steps in-house, we are able to control the quality real-time and guarantee it. Soloan designs, constructs and maintains all installations in-house and delivers to national and international customers (in particular to Germany). Complete production takes place in our own factory in the Netherlands, so that we can provide fast delivery. From steel construction to the equipment for air treatment, ventilation, heat recovery and control and from hoisting and lifting to (motorised) rail systems. By using this integral approach, we are able to limit the chance of malfunctions and guarantee you continuity. And if you want to replace a component, we make deliveries directly from stock. Soloan offers a standard 1-year guarantee that you can extend up to 5 years.